Carbs and veggies are literally two of my favorite things. 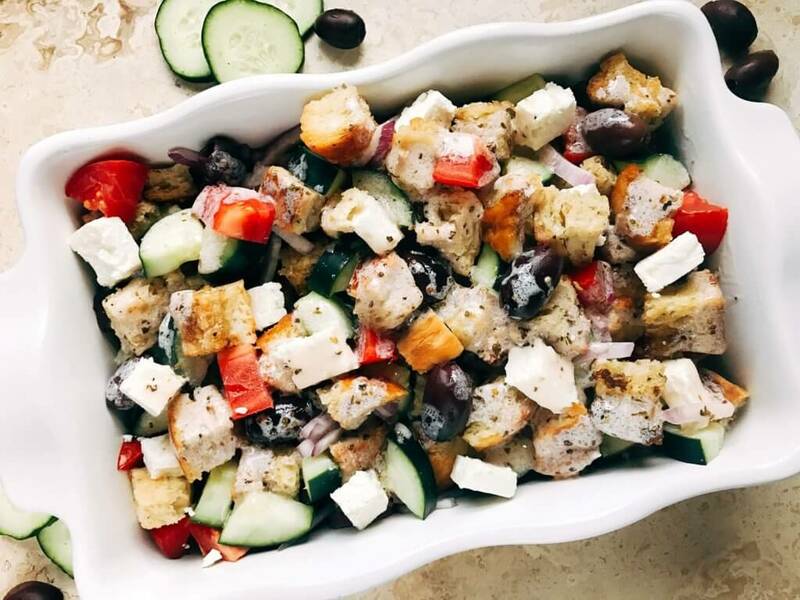 You can find me with a big bowl of this Creamy Greek Panzanella Salad out on the deck. 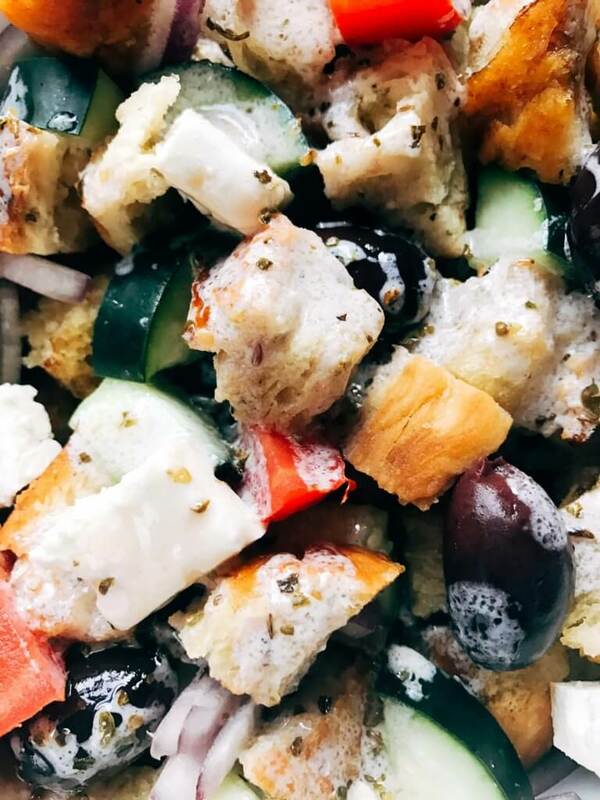 Panzanella is a salad from Italy, specifically Tuscany, that is made with stale bread and tomatoes. Essentially it is like what my husband’s normal salads look like: a pile of croutons with a few veggies mixed in. Even though it hails from Italy, when I was living there in college you did not see it too often in restaurants. But when you did find one, it was normally very special! 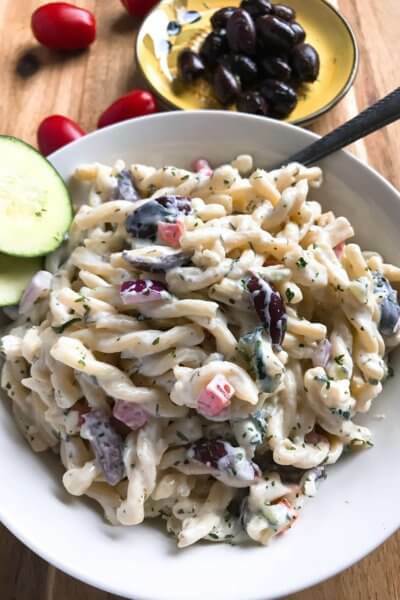 If you have been to this site before, you might have noticed that I tend to combine different flavors, recipes, and ideas into new combinations. So here is another one! 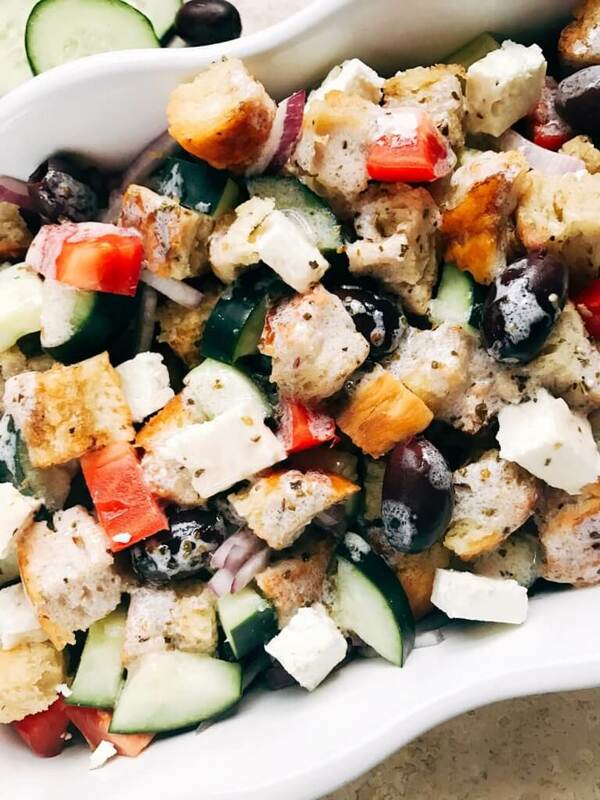 The panzanella salad is combined with the Greek salad and topped off with a creamy, Greek yogurt vinaigrette. Yummers. 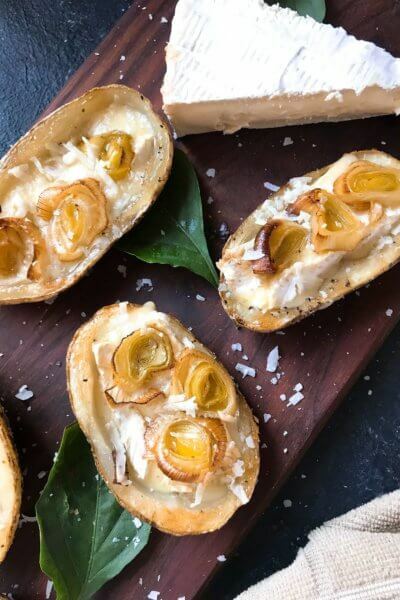 It is incredibly simple to make and a BEAUTY that will grab the attention of everyone at your grill-out. 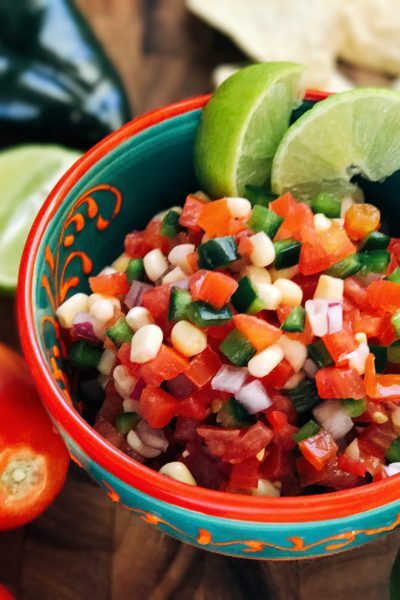 This salad is perfect as a side dish for a summer gathering like grilling or a BBQ. It is fresh and bright while still holding some substance (thanks, bread and cheese!) and goes with just about anything. 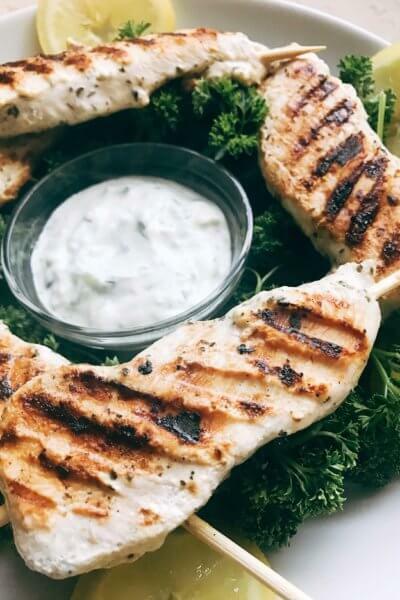 A simple and hearty side dish or salad, perfect for a BBQ or grilling. Cut the bread into approximately 1" cubes and spread on a baking sheet. Drizzle the bread with olive oil and a little salt. Bake the bread until the cubes are just crunchy but do not squish or bend. They should not be as hard as croutons. The time this takes will depend on how dry/dense your bread already is (for me it typically takes 20-30 minutes). Set aside to cool to room temperature. While the bread is baking, prepare the mix-ins. Cut the cucumber and tomatoes into 1/2" chunks and place in a large bowl. Thinly slice the red onion and place in the large bowl with the cucumber and tomatoes. Add the kalamata olives (you can use either whole or sliced). 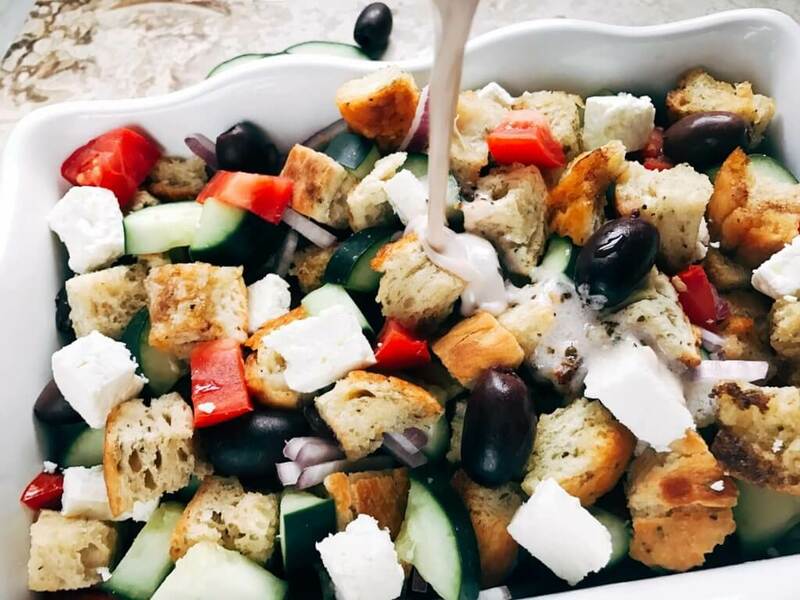 Cut the feta cheese into 1/2" cubes or use crumbles and add to the vegetables. In a small bowl, prepare the dressing by combining all of the ingredients. Whisk together and salt to taste. When the bread is done and cooled to room temperature, add the bread to the vegetables bowl and toss to combine. Pour the dressing over the salad and toss to coat. Let the dressing sit on the salad ideally for 30 minutes in the refrigerator before serving so that it starts to soak into the bread. It will not make the bread soggy. Make it vegan by skipping the Greek yogurt. Ideally you want to use a denser bread for this salad, something more rustic with less air. The weight of the bread will vary based on exactly which one you use, but you want to aim for 6 cups in volume regardless. Panzanella is one of my favorite things but I’ve never tried it with a creamy dressing. This looks fabulous! Great recipe, I like the exchange between Italian and Greece, many recipes are very similar between the 2 countries. In the south of Italy they actually sell a special bread called Biscotto which is made specifically for such salads. It is crunchy and whole wheat, too bad is not easy to find elsewhere. Sounds wonderful! I lived in North/Central Italy and did not find any up that way, which is too bad! That sounds so lovely! 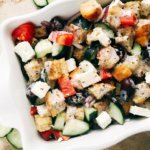 I can’t believe I’ve never tried Panzanella salad before! I need to remedy this. 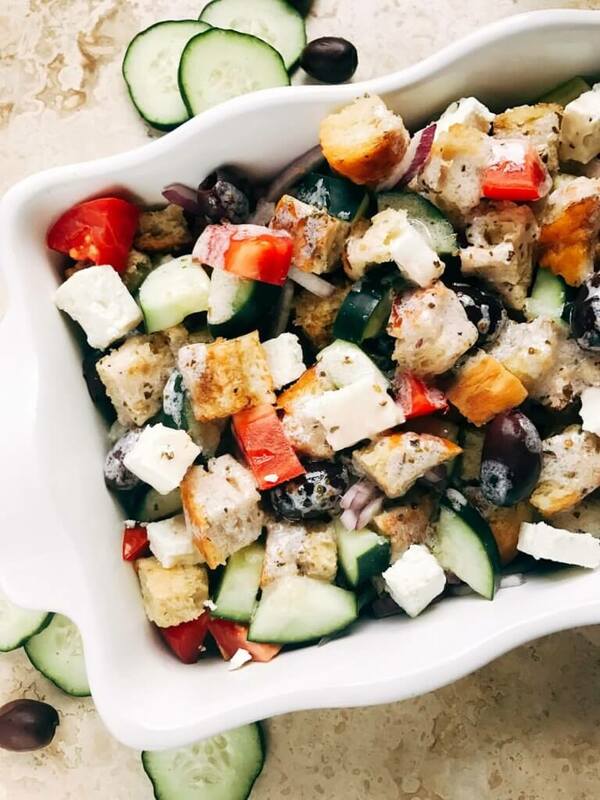 Panzanella Salad is one of my all time favorites, and this one is so colorful and pretty! I love it!